At the stop light just south of the Belgrade Overpass turn west onto Amsterdam Road-Hwy #347. Drive west 3 miles on Amsterdam Road. You will cross the Gallatin River. 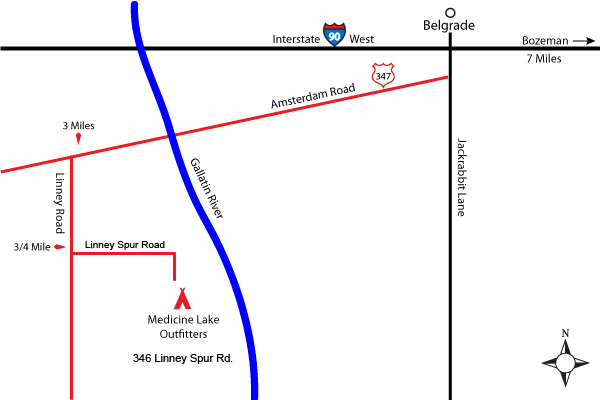 The first County Road west of the river is Linney Road. It is signed and paved. Turn south onto Linney Road and drive 3/4 mile south. At exactly 3/4 mile turn left or east on Linney Spur Road. Drive east on Linney Spur back towards the river. There are several places on Linney Spur with horses and arenas. Please don’t be confused by that. Additionally you should know that if you are using a GPS to find us, it will take you down the wrong lane when you get close. The neighbors got tired of that a long time ago. So please use these directions instead of the GPS once you have turned onto Linney Spur. About 300 yards after your turn onto Linney Spur, you will come to a three way fork. There is a metal silhouette sign on the middle fork depicting running horses. It has the number 346 on it. The sign has an arrow pointing down the correct lane. Our entrance gate is about 100 yards past the silhouette sign. When you get to the gate you will see a sign that reads Medicine Lake Outfitters. Once you are through our gate the lane will turn to the south and bring you into a set of buildings with red roofs. Parking is on the west end of the cedar sided building. It is the first building you come to. There is a parking sign there. Please stay with your vehicle. We will meet you there when your ride is scheduled to start. On average it is about a twenty minute drive from Bozeman to here. Please bring a cell phone and call us at (406) 388-4938 if you need additional help with directions.